A locker in the office premises is the perfect abode for keeping all the important documents and papers in good condition. Investing in office lockers UK would prove to be a fruitful decision in bringing about a sense of discipline to the surroundings. Apart from these, it also extends its hospitality in taking care of all the belongings of the employees as well as the management. There are many organizations that believe in giving nominal importance to lockers in the office premises. Not giving importance to proper storage would not only hamper the functioning of your organization, but would also diminish the enamor of your office atmosphere. Moreover, it might even encourage chaos and disorganization, disrupting the productivity of the employees. A locker brings in discipline, a sense of security and not to forget a place for each and everything that otherwise would have created clutter. Hence, lockers should be an inevitable property that an organization should proudly invest in. Are you thinking of buying office lockers? Well, here are a few points that could be used to buy amazing office lockers that will improve you work environment. Let me walk you through some of the methods that could be used to uplift the decor of your office with the right office lockers. Colors play a pivotal role in influencing the energies of a place. When you are installing lockers go for those colors that not only add to the decor of the premises but would also ace up the positive energy in the surroundings. Bright colors would accelerate some vibrant energy and on the contrary dull colors would fade out the energies of the room. You can go for bright, dark or subtle colors when it comes to choosing lockers for your office premises. Also, white, light grey office locker could give a simple and sober look to the office premises. Talking about the style, you have the wooden, plastic, electronic and the metal lockers that influences the aesthetics. Apart from the type of material you can take into consideration the textures, shape and size of the locker that contributes to the well being of the surrounding. A wooden locker is opted when you want to give a classic look, a metal locker or an electronic locker could be the perfect choice for premises that have a magnanimity of sensitive information that needs to be stored properly. Plastic lockers are trending the world of storage solution and choosing the perfect plastic locker for your office will also prove to be fruitful. Also, when you select the size and shape of the locker be careful, as an oversized locker could make a space look smaller. Hence, choose wisely when it comes to the size of the locker as they too contribute in uplifting the glory of the premises. Go for those lockers that are easy to use. By doing so you get to increase the level of convenience for the employees. A less complicated locker on the premises would reduce the level of commotion that otherwise would have added to negative energies of the office environment. You can opt for electronic lockers where the employees do not have to bear the burden of looking after their respective keys, making way for convenience. You can go for some personalized storage solutions that reflect the brand of your company. 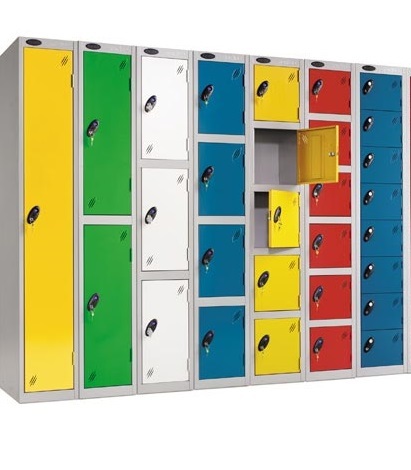 Select lockers that complement the colors that your company’s logo proudly flaunts. You can also get the company’s name or logo printed on the lockers that will be adorning the office premises. By doing so you get to give a personalized look and feel to the office surroundings. The glory of a storage locker does not end with investing in one of the most stylish and highly functional storage lockers. It is a continuous process where constant care should be extended in looking after its well-being. A well-maintained office locker generously contributes to the office aesthetics in general, which indirectly helps in boosting the productivity of the employees. A neatly arranged locker in the office premise reflects a sense of discipline and organization that the employees would generously follow. A movable locker is a storage solution that will help in coining the glory of the premises. Want some extra space you can move these lockers with utmost ease and tranquility. With movable lockers, you can very well adjust the office decor as per your needs and requirements. It is also one of the perfect choices if your office lacks space. Decide well in advance the number of lockers that you would be requiring for your employees. This will prohibit the premises from being bogged down with the too many lockers. Moreover, judiciously placed office lockers would give a neat and clean look to the surroundings. The aforementioned points when kept in mind will considerably help you in fabricating an office environment with the right lockers that stands true to your company standards. Having said this, investing in office lockers UK would not only add to your office decor, but will also play a pivotal role in influencing the productivity of your business. This entry was posted on Friday, December 15th, 2017 at 8:56 am	and is filed under lockers. You can follow any comments to this entry through the RSS 2.0 feed. You can leave a comment, or trackback from your own site.